You will find below the horoscope of Amy Smart with her interactive chart, an excerpt of her astrological portrait and her planetary dominants. If you know the time of birth of Amy Smart, we would appreciate it if you would send us your information with your source, at stars@astrotheme.com. To thank you for contributing to the enhancement of our astrological database, we shall be glad to send you the astrological portrait (34 pages) of this celebrity. Horoscopes having the same aspect Venus square Neptune (orb 0°36'): Madonna, Kim Kardashian, Cristiano Ronaldo, Pamela Anderson, Whitney Houston, Soeur Emmanuelle, Marine Le Pen, Victoria Beckham, Tina Turner, Emma Stone, Pink (singer), Nolwenn Leroy... Find all the celebrities having this aspect. Horoscopes having the same aspect Mars trine Uranus (orb 2°33'): Brad Pitt, Napoleon I, Gerard Butler, Adriana Karembeu, Ingrid Chauvin, Michael Fassbender, Jennifer Garner, Carmen Electra, Anna Nicole Smith, Lance Armstrong, Sylvia Plath, Carrie Underwood... Find all the celebrities having this aspect. Celebrities clicked on in real-time: 575,954,884 times. Amy Lysle Smart was born in Topanga, California. Inspired by her friend Vinessa Shaw, Smart studied ballet for ten years and enrolled in acting classes when she was 16, but began her career as a fashion model, working in Italy, France, Mexico, and Tahiti (Awards-winning spots for Club Med directed by Bruno Aveillan). Smart's first film role was for director Martin Kunert's film Campfire Tales, followed by a very minor role in the 1997 film Starship Troopers as the co-pilot for (and friend of) Carmen Ibanez (Denise Richards). Here are some character traits from Amy Smart's birth chart. This description is far from being comprehensive but it can shed light on his/her personality, which is still interesting for professional astrologers or astrology lovers. 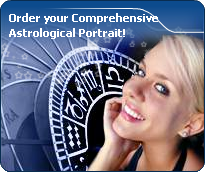 In a matter of minutes, you can get at your email address your astrological portrait (approximately 32 pages), a much more comprehensive report than this portrait of Amy Smart. Warning: when the birth time is unknown, which is the case for Amy Smart, a few paragraphs become irrelevant; distributions in hemispheres and quadrants are meaningless, so are dominant houses and houses' accentuations. Therefore, some chapters are removed from this part. Amy Smart, Fire is dominant in your natal chart and endows you with intuition, energy, courage, self-confidence, and enthusiasm! You are inclined to be passionate, you assert your willpower, you move forward, and come hell or high water, you achieve your dreams and your goals. The relative weakness of this element is the difficulty to step back or a kind of boldness that may prompt you to do foolish things. The predominance of Water signs indicates high sensitivity and elevation through feelings, Amy Smart. Your heart and your emotions are your driving forces, and you can't do anything on Earth if you don't feel a strong affective charge (as a matter of fact, the word "feeling" is essential in your psychology). You need to love in order to understand, and to feel in order to take action, to the detriment of a certain vulnerability against which you should learn to fight. Earth qualities are under-represented in your chart, with only 9.83% instead of the average 25%. Deficiency in Earth may indicate that you have no interest in material and concrete values. It is likely that you live too much in your heart or in your mind, or even in your enthusiasm! The fact remains that you may end up in tricky situations, due to your lack of good sense or forethought: material life is unavoidable even if you are rather idealistic, dreamy, or easily content. You must tackle concrete life necessities, for fear of... being forced to cope with them, later, in much more unpleasant ways! Amy Smart, the Cardinal mode is dominant here and indicates a predisposition to action, and more exactly, to impulsion and to undertake: you are very keen to implement the plans you have in mind, to get things going and to create them. This is the most important aspect that inspires enthusiasm and adrenalin in you, without which you can grow weary rapidly. You are individualistic (maybe too much?) and assertive. You let others strengthen and improve the constructions which you built with fervour. After this paragraph about dominant planets, of Amy Smart, here are the character traits that you must read more carefully than the previous texts since they are very specific: the texts about dominant planets only give background information about the personality and remain quite general: they emphasize or, on the contrary, mitigate different particularities or facets of a personality. A human being is a complex whole and only bodies of texts can attempt to successfully figure out all the finer points. Compassion and self-sacrifice: you are fond of this romantic mode and you are willing to express your feelings, the intensity of which is unlimited, Amy Smart. With excitement and imagination, you dream your amorous relationships as much as you actually live through them. The line between the concrete world and your huge hopes is so tenuous that you don't know anymore where it is, although your particularly rich sensuality prompts you to experience your feelings concretely. You want to share communion and passion with your partner. The lyrical flights of your feelings break from your heart as waves that you do not attempt to control because they give you a real, almost voluptuous and carnal joy. You give a lot – sometimes too much - without reservation, almost without propriety, totally revealing your vulnerability during your amorous exchanges because you are sure of the quality and the might of your feelings: they are so powerful and overwhelming that you are aware that nothing can resist them. It is difficult to find a more sensitive person than you, Amy Smart. You are able to contain your aggressiveness and it may be hard for you to exteriorize your feelings. You are usually passive and you draw your strength from inertia and resistance more than from the will to take action. Your mood is changing, you show little of yourself and you may surprise with your inopportune reactions that come late, when people have forgotten what it was all about. The only area where you express yourself with zeal and where your actions are successful is the area of home or, more symbolically, in the fields where you can achieve security. In other words, you need to feel comfortable before you can move, in concrete matters as well as in sexuality. This text is only an excerpt from of Amy Smart's portrait. We hope that it will arouse your curiosity, and that it will prompt you to deepen your knowledge of astrology, as well as to visit and use the wide range of free applications at www.astrotheme.com.